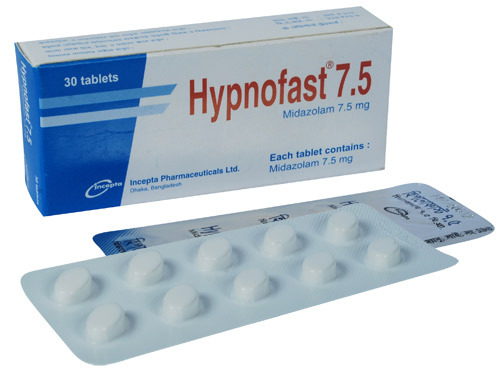 Hypnofast 7.5 tablet: Each tablet contains Midazolam BP 7.5 mg (as Midazolam Maleate). 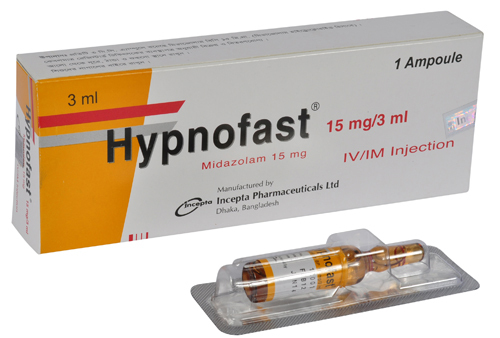 Hypnofast 15 mg/3 ml Injection: Each 3 ml ampoule contains Midazolam BP 15 mg (as Midazolam Hydrochloride). 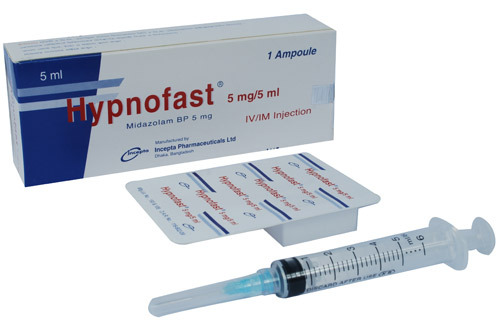 Hypnofast 5 mg/1 ml Injection: Each 1 ml ampoule contains Midazolam BP 5 mg (as Midazolam Hydrochloride). 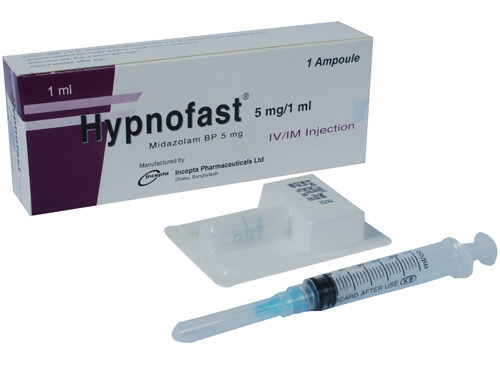 Hypnofast 5 mg/5 ml Injection: Each 5 ml ampoule contains Midazolam BP 5 mg (as Midazolam Hydrochloride). Midazolam is a sleep inducing agent characterized by a rapid onset and short duration of action. It also exerts an anxiolytic, anticonvulsant and muscle-relaxant effect. Sedation in premedication before surgical or diagnostic procedures. Oral dosage: For adults 7.5-15 mg daily. In elderly and debilitated patients, the recommended dose is 7.5 mg. In premedication, 15 mg of Midazolam should be given 30-60 minutes before the procedure. In healthy adults the initial dose is approximately 2.5 mg. In cases of severe illness and in elderly patients, the initial dose must be reduced to 1 to 1.5 mg. The dose is 10-15 mg I. V.
Adult: 0.07-0.1 mg/kg bodyweight i. m. Usual dose is about 5 mg.
For preoperative sedation, rectal administration of the ampoule solution (0.35-0.45 mg/kg) 20-30 min before induction of general anesthesia. At the start of therapy, drowsiness during daytime, confusion, fatigue, headache and muscle weakness may occur which usually disappear with repeated administration. Following parenteral (IV or IM) administration of Midazolam, fluctuations in vital signs have been noted including respiratory depression, apnoea, variations in blood pressure and pulse rate. Midazolam IV should be administered very slowly. Midazolam should be avoided during pregnancy unless there is no safer alternative. Since Midazolam passes into breast milk, it should not be administered to breast-feeding mothers.